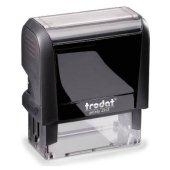 Your business is about get on another level with this pre-inked customizable stamp. Add up to 6 lines of information and include your fancy logo. Perfect for newsletters, envelopes, checks or thank you cards. If you need a larger stamp please email customer service.